On the topic of Coulomb’s law, the force between electric charges has been studied. In a review of the electric field, another form of Coulomb’s law has been discussed which is expressed by the equation F = q E, where F is the electric force, q is the electric charge and E is the electric field. Can be said that Coulomb’s law is a law of physics that explains the relationship between the electric charge (q) and the electric field (E). Gauss’s law is another physics law that explains the relationship between the electric charges and the electric fields. Gauss’s law was formulated by Carl Friedrich Gauss (1777-1855), a German theoretical physicist and mathematician. The electric field generated by one or several electric charges can be calculated easily using Coulomb’s law, but the calculation becomes more complicated if what is determined is the electric field produced by an electric charge distribution. Gauss’s law provides a more natural way to determine the electric field produced by an electric charge distribution. Also, if an electric field is known, Gauss’s law can be used to determine the distribution of electric charges that produce the electric field. The following is reviewed the concept and equation of Gauss’s law. Review a positive electric charge in the center of the ball as shown in the figure on the side. If the radius of the sphere is R, then the electric field strength generated by the charge across the sphere is E = k Q/R2 and the surface area of the sphere is A = 4 π r2. To visualize the electric field, the electric field lines are drawn, but in the figure, only four electric field lines are represented. The electric charge is positive therefore the electric field lines are drawn out from the center of the ball where the electric charge is located and each line of the electric field is perpendicular to the surface of the ball that passes through it. The farther away from the electric charge, the electric field gets smaller so that the distance between the electric field lines is also farther away. F = electric flux, Q = electric charge, k = 9 x 109 N m2/C2, εo (the vacuum permittivity) = 8.85 x 10-12 C2/N m2, π = 3.14. Based on this equation it is concluded that the electric flux (F) passing through a spherical surface is proportional to the amount of electrical charge (Q) in it and does not depend on the radius of the ball (R). 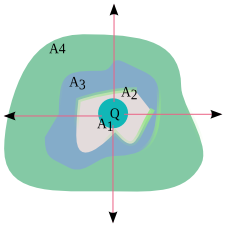 The figure on beside shows four closed surfaces in which there is an electric charge Q. The first surface is circular while the other surface has an irregular shape. The electric charge is positive so that the electric field lines represented by the four arrows are drawn out of the charge. The four electric field lines pass through a circular surface, and other surfaces that have irregular shapes are also passed through these four lines. In the review of electric flux, it is stated that electric flux is the lines of an electric field that penetrate a specific surface area. The electric field lines that penetrate the four surfaces are the same so that the electric flux on all four surfaces has the same magnitude. The electric flux that penetrates the spherical surface is Φ = Q/εo so that the electric flux that penetrates other surfaces with irregular shapes also has the same magnitude, namely Φ = Q/εo. Based on this explanation it can be concluded that the electric flux that penetrates a closed surface in which there is an electric charge, does not depend on the surface shape and the magnitude is Φ = 4 π k Q = Q/εo. The figure beside shows two electric charges that are inside a closed surface. Q1 and Q2 are positive so that if they are drawn, each charge has an electric field line that penetrates out from within the surface. Total electric flux is the total number of electric field lines that penetrate out from the closed surface. Because the lines of the electric field of charge Q1 are equivalent to electric flux Φ = Q1/εo and the lines of the electric field of the charge Q2 are comparable to the electric flux Φ = Q2/εo, the total number of electric field lines is equal to Q1/εo + Q2/εo = 1 / εo (Q1 + Q2). Q net is the total amount of electrical charge that is inside a closed surface. If there is an electric charge outside the closed surface, the charge is not taken into calculation because the electric flux it produces is zero. The electric flux is zero because the lines of the electric field coming from the charge penetrate into the closed surface and then exit again. The closed surface of Gauss’s law is the imaginary surface presented to calculate the electric flux caused by an electric charge. Gauss’s law can be used to determine an electric field if the distribution of an electric charge is known or can also be used to determine the distribution of electric charges if an electric field is known. The use of Gauss’s law to solve various questions is explained in the article about the application of Gauss’s law.